Wool, leather, silk, and nylon are dyed beautifully. 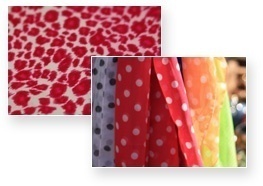 Mimaki acid dye inks produce vivid and brilliant colors on animal fibers, including wool, leather, silk, and synthetic protein fibers, such as nylon, by utilizing their acidic properties. Mimaki’s unique technology allows printed inks to penetrate through to the reverse side of the material and delivers delicate printing resembling that of a traditional printing process. Mimaki has researched and developed inks and printers to solve various technical issues, including ink bleeding/shedding, gloomy colors, and fabric wrinkling, which are attributed to the properties of protein fibers. 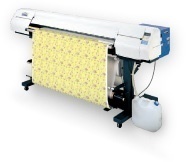 As a result of these developments, the printer optimizes the capabilities of the acid dye ink and enables the ink to produce vibrant colors on wool, leather, silk, and nylon. In addition, the printer maximizes the features of each fabric with its ability to print on thick materials.